While completing the first tests of the Skoda Fabia Super 2000, Skoda Auto indirectly celebrated 100 years since one of the most successful periods of its competition history. In 1908, Laurin & Klement vehicles (the F, FC and FCS models) joined the ranks of leading car competitions world-wide and beat numerous official and unofficial speed records. Fast-moving technological development required more expertise and a better support. Seeing the necessity to develop the business, Laurin & Klement became a joint stock company in 1907. However, technological development was not the only thing that needed support and so the management also invested in car racing, one of the most powerful promotion tools. In December of the same year, the Company hired Otto Hieronimus, a race car designer and race driver renowned across Europe. Over the following few years, Hieronimus, Count Kolowrat and a few other drivers made the Laurin & Klement brand world-famous. 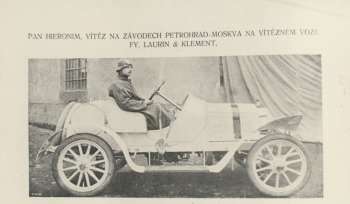 Laurin & Klement vehicles celebrated their first racing achievements in the Zbraslav-Jíloviště hill climb race in March 1908, where the brand won six categories and finished second in five other classes and third in yet another event. Later that year in Bosnia, Laurin & Klement won the Grand Plague for regularity, Count Paul Draskovich won the 2-litre category of the Ivanpass hill climb race and Count Alexander Kolowrat won the 1.5 litre category of the Ries hill climb. Hieronimus was successful also in the St. Petersburg to Moscow competition. He won his category and although this category was the smallest of the four categories in that race, he managed to finish fifth overall. The brand then triumphed in the Semmering hill cimb, where Laurin & Klement vehicles won in all three categories it entered and also achieved two second-place and two third-place finishes. After that, Hieronimus beat the unofficial speed record in a flying kilometre race in Neukirchner-Alle (31.2 s, average speed 115.385 km/h). In December 1908, Václav Klement decided to go to England and the mission was again a success - with 118.72 km/h, Hieronimus set a new official speed record on the Brooklands race circuit.